Comments: The name raccoon is derived from the Algonquin Indian word "arathkone" meaning "one who can scratch with their hands." Raccoons are noted for "washing" their food in water. Most people recognize them by their black mask and ringed tail. They are intelligent and extremely curious. Their dens are located in hollow trees, cavities below rock ledges, under old farm buildings and in chimneys. They forage alone during the night, often within a square mile. Sows bear litters of 3-7 kits in the spring and raise them alone. In the wild, they live up to six years. 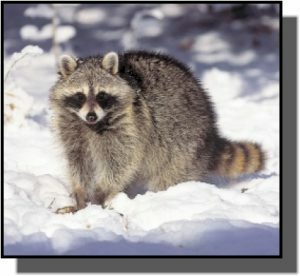 Distribution: Raccoons range from South America to southern Canada. They are found in woodlands, both rural and urban, throughout Kansas. They are usually more abundant near agricultural areas. Food: Raccoons are omnivores with more than half of their diet being plant matter. They eat fruits, berries, nuts, grains, insects, fish, frogs, small turtles, crayfish, snails, mussels, mice, birds, and eggs. They also raid garbage cans.